Hi! I'm back again trying out another one of Pinspired Challenge with the photo below as an inspiration. Click the photo below for details or to join. Papers - Farmhouse Collection by Crate Paper, American Crafts Cardstock, Hero Arts Kraft Paper. Love the layers and the colorful birds! Thanks for playing with us! Your birds are adorable! So glad you linked up with us at Pinspired Challenges. I LOVE that background you created! Fabulous card! Thanks for playing along with Pinspired Challenges! Super adorable!!! Love the chicks!!! FUN layout to display them and the DP rocks with them! wow this is adorable. 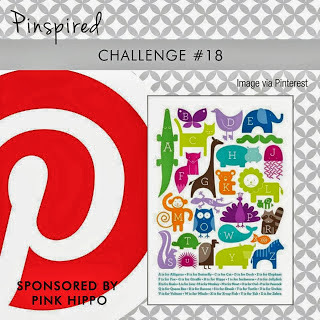 thanks for joining us at PINspired Challenges..